Centuries-old worker’s graffiti and handprints from craftsmen dating back more than 200 years have been uncovered by specialists examining the roof before the replacement of 14,000 tiles begins as part of the renovation work at Wentworth Woodhouse. The marks at Wentworth Woodhouse, near Rotherham, South Yorkshire, were found in timbers during preparatory work to fix a leaking roof. More than 20 messages, some dating back to 1806, have been found. A preservation trust bought the house, which stands in parkland, for £7 million in 2017. The messages were discovered by specialists examining the roof before the replacement of 14,000 tiles begins. The Wentworth Woodhouse Preservation Trust estimates it will need up to £200 million to restore the house. Built between 1725 and 1750, the front of the house is more than 600ft (180m) long. The main house has more than 200 rooms. 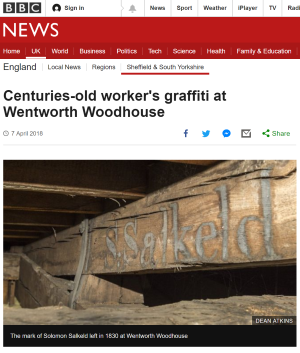 Graffiti has been found in leadwork on top of the roof, under the slate and across the roof beams with the most modern marks in the roof date from the 1950s.